As I have mentioned I am using the Literacy Lift Off Model of teaching literacy this term. I am in charge of phonics. It is pretty hectic trying to teach and consolidate a lesson in 10 minutes! 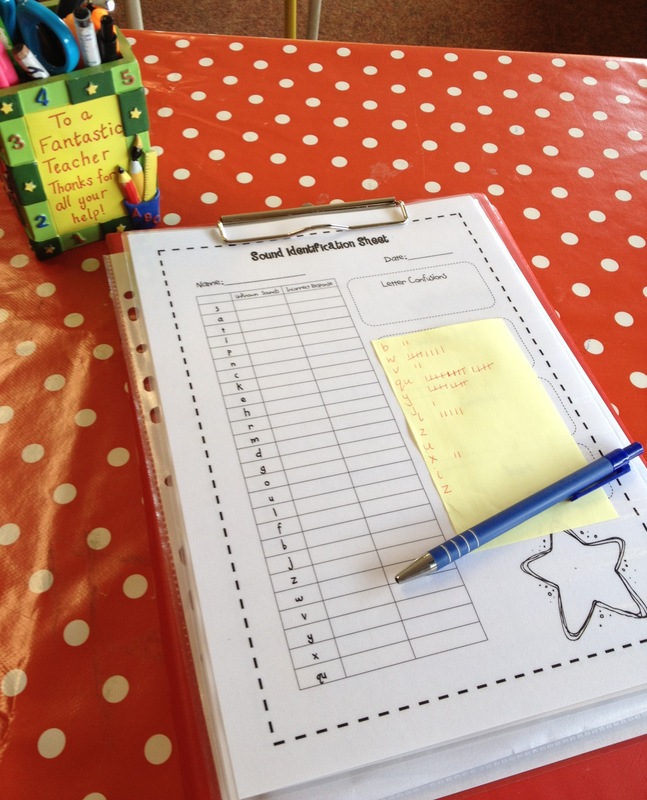 I have been busy creating worksheets and games that help us along! I spent quite a while coming up with a “th workpack”. 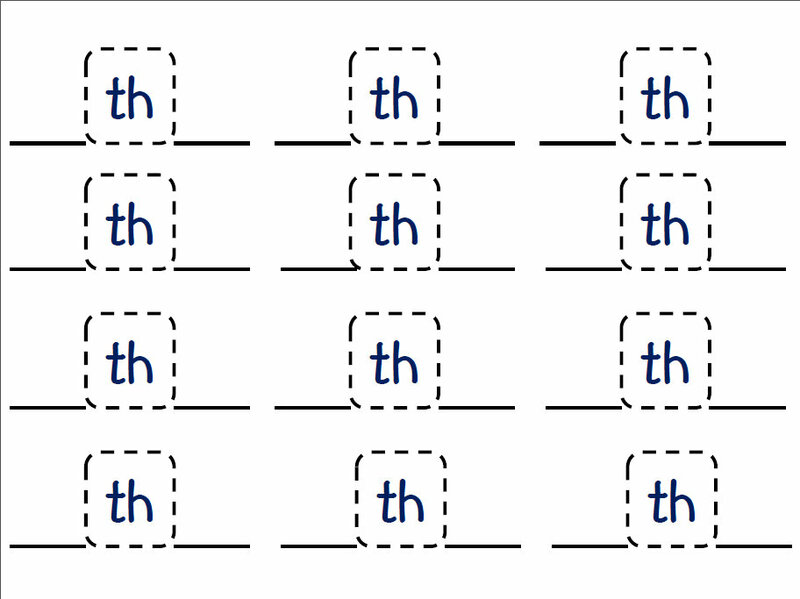 I have included both sounds “th” as in them and “th” as in thick. Below are some of the sheets that I created for Power Hour last week. I inserted the sheet below into a poly-pocket so that my pupils could write/erase using a whiteboard marker. We used it to explore where the “th” sound was in the word (beginning, middle, end) and then sounded out and wrote the word. I used these sentence strips for consolidation at the end of the week. It was also a useful way to review capital letters and punctuation marks. I am delighted that my class has started the literacy initiative “Literacy Lift Off”!!! It is an intensive programme of Reading and Writing. Over the course of 1 hour pupils engage in a number of “stations” where activities are tailor made to their own level of competency over time we gradually lift the complexity of the what they can do in both reading and writing. The aim of Literacy Lift-Off is to make pupils constructive learners. It teaches them ‘how’ to problem-solve independently. Children are divided up into small groups ( max 7 per group). There are 5 stations and children spend 10 minutes at each. By the end of the hour they will have visited each activity and will take home their “new read” for homework. There are now 5 adults in my room from Monday-Thursday and this is what we are up to!! Pupils read previously seen PM+ Readers. Purpose: Development of enjoyment, fluency, comprehension and speed. Children will explore and then take home a new reader each day. This challenges the pupils to discover new ways to go beyond their current operating ability and lift their literacy processing. Purpose: Pupils learn to use strategic activities to read new texts. Children are supported to improve their abilities in blending & segmenting words ( to make and break words) through lots of games and activities. Pupils write sentences using words that they encounter in their readers and the high frequency words that they are studying. Purpose: That they will learn how they can write their own messages by hearing and recording sounds in words, using analogy and learning unusual words. Purpose: Children become aware of “tricky words” that allow them to access text with greater ease and to increase their reading fluency and accuracy. “Power Hour” as we are calling it is a fantastic reading initiative and I cannot wait to see the results. The school has invested thousands of euro and lots of “teacher power” into Literacy Lift Off !!! I am so grateful to all of those who have been involved in fundraising over the last number of year. The kids are LOVING it so far. Mind you, I have never been busy. The team have been meeting 2o minutes early every morning since it started. I spent a few hours planning this weekend for the coming week only!!! Watch this space as I will be keeping you up to date on our “Power Hour” activities. If any of you are already doing LLO I would love to hear from you. Any tips or advice for newbies?!! 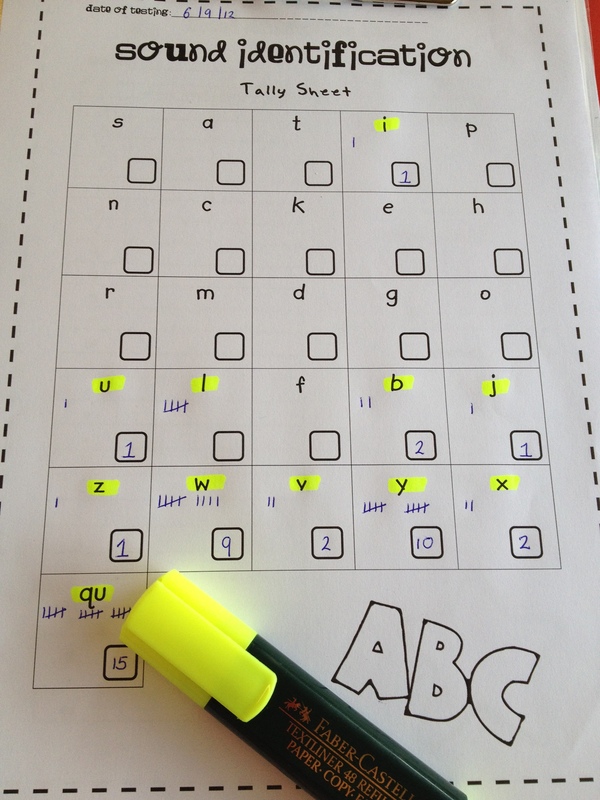 Here is another fun way to practice spelling and phonics skills. All you need are some plastic letters and my Elkonin Boxes. Please click here for a link to download the boxes from a previous post. We tend to voice the initial and final sounds of words a little louder which makes them slightly easier to hear. 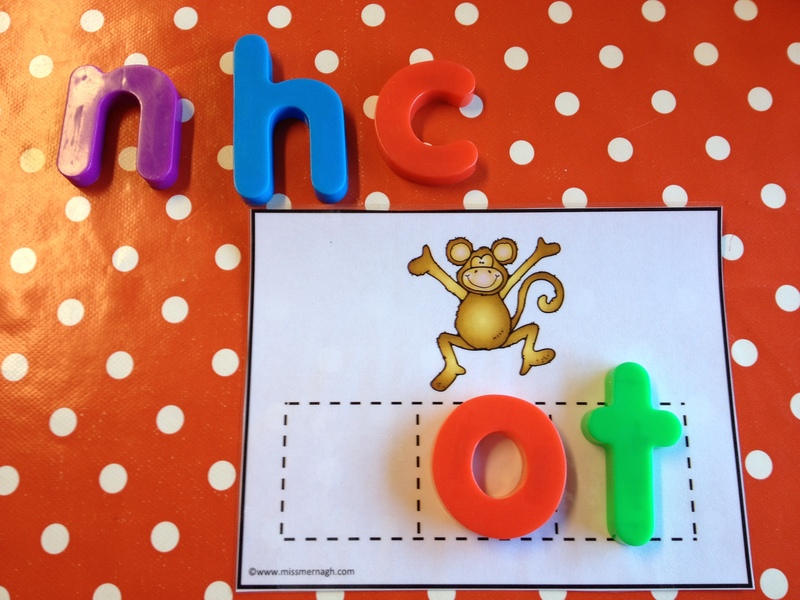 Young children will often spell words without the middle/medial sound so “cat” can be written as “ct”. Elkonin boxes can be so handy when practicing or teaching sounds. 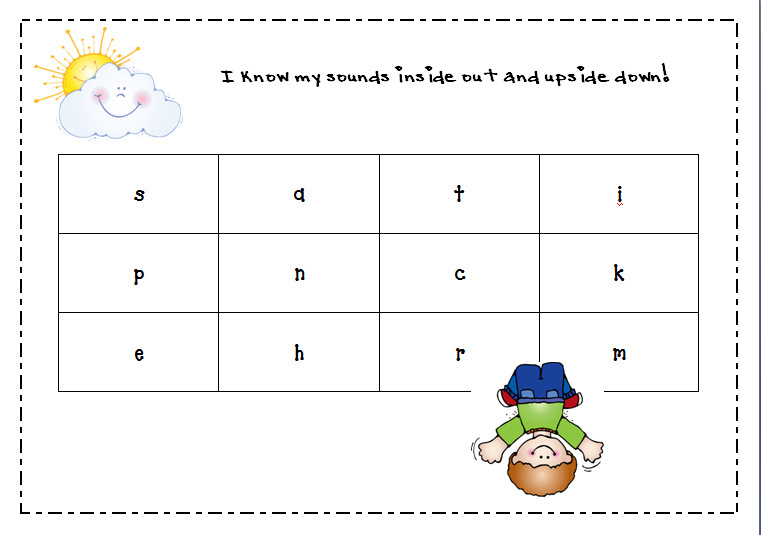 The photo below shows how they can be used to practice the initial sound in words. What is the first sound in “cot”? 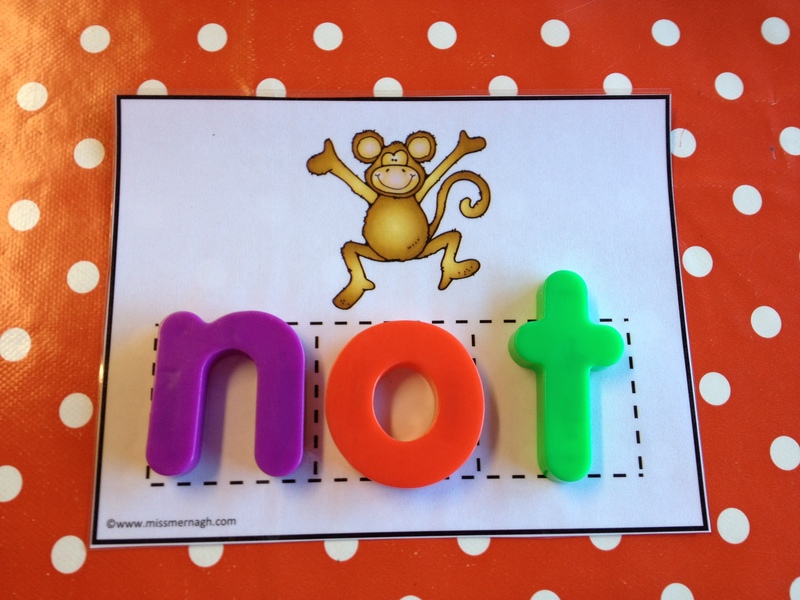 Can you change “cot” into “not”? Most spelling programmes are based on the concept of word families. 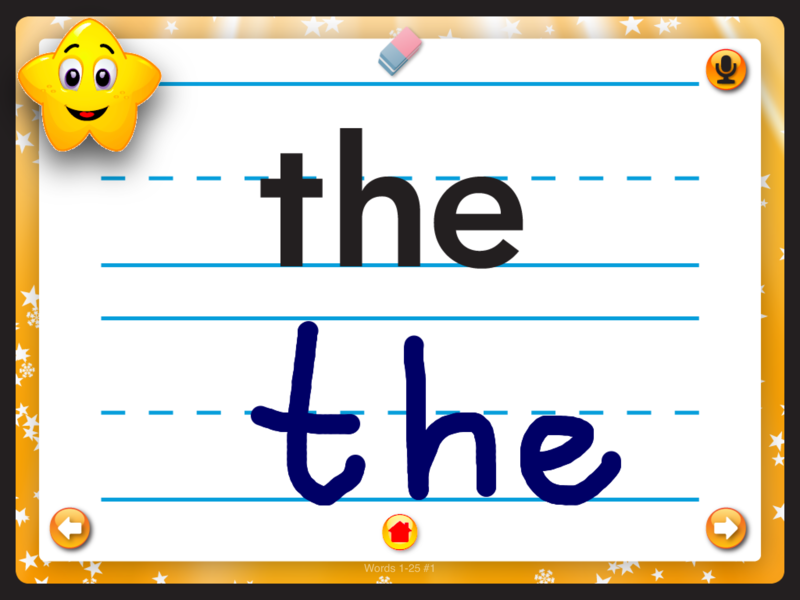 Children learn to spell words with same end sound (rime). By changing the first sound(s) before the vowel (onset) you can create a new word from the same family. The photo above shows the “ot” family. Can make not, hot, cot, spot, lot…? Here is the trickier ” medial” sound. What is the middle sound in “nut”, “net”, “not”? You can use them to practice blending or “stretching out” words. 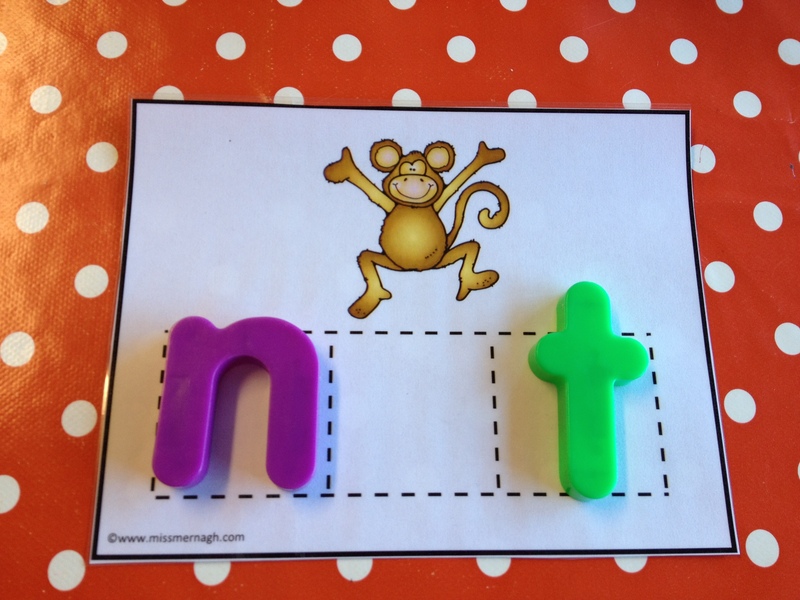 Create a word on the board and have your child stretch out the sounds. Then swap roles so your child is spelling out words for you to decode. For Parents of Junior Infants: Brush up on your (Jolly) Phonics! This one is especially for parents of children who have just started school. If your child’s school is using Jolly Phonics chances are your child has already begun to learn his or her sounds. Jolly Phonics is a form of synthetic phonics. This means that it first teaches the letter sounds and then teaches children to “blend” sounds together to read and write words eg. cat = caat. Blending is often referred to as “sounding out”. 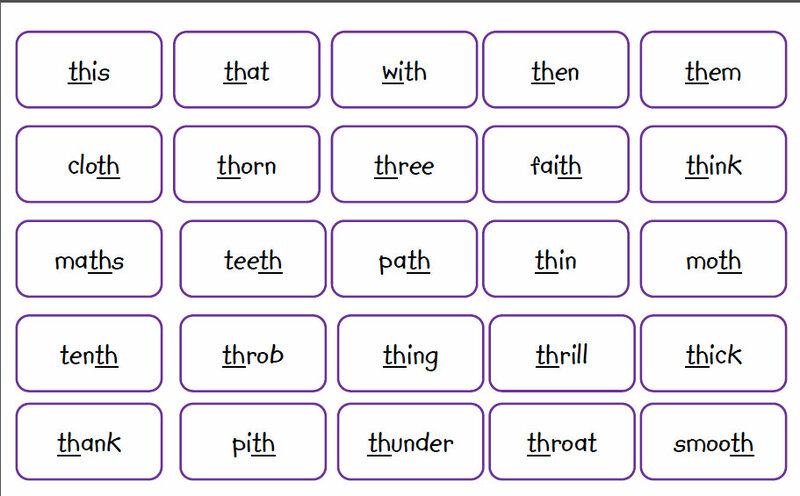 Children are also taught to “segment” which involves breaking words up into sounds eg c/a/t. We do this when spelling words. 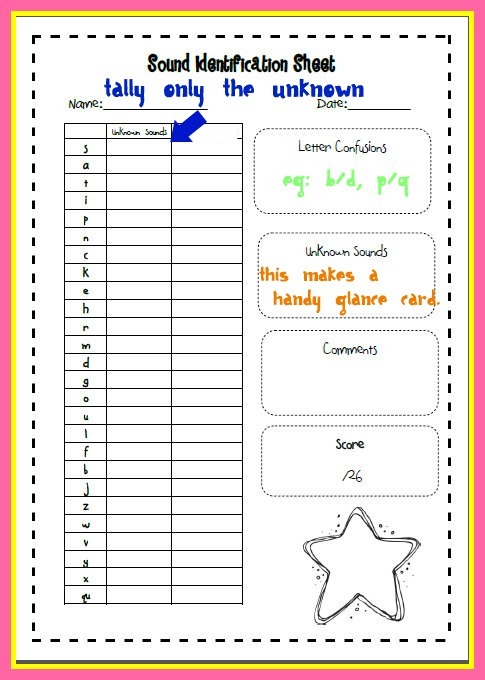 Download this free glance card and save it for when you are doing homework. Randomly point to a letter and ask your child what sound it makes. Call out a sound and ask your child to point it out. 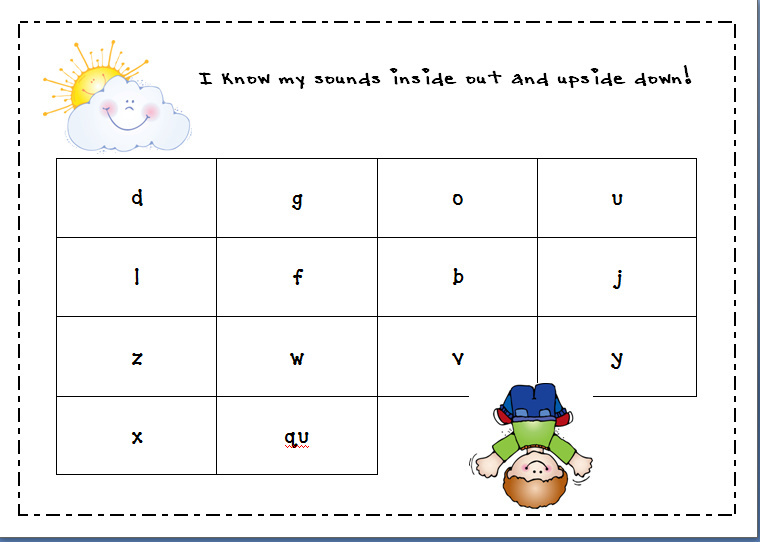 You now have an easy way to check your child’s sounds 🙂 Just remember that it is letter sounds and not letter names that children learn in the beginning. Be careful when pronouncing these sounds. Think of a simple 3 letter word eg sat and sing it rather than say it! It is easier to hear the constituent sounds if you do. “p” is a short sound as in pig. It has a very gently “uh” sound at the end. Curl your lips in around your teeth & push them out like a little explosion. The “uh” sound is subtle rather than pronounced. “c” and “k” are a short sounds as in cap and kit. It has a very gently “uh” sound at the end. “d” is a soft, short sound as in dip with a quite rather than pronounced uh sound at the end. I hope that this helps :). It is so important to get it right in the beginning. If you have any further questions please feel free to email me info@missmernagh.com. Keeping on top of sounds! I don’t know about you but sometimes it is hard to keep on top of who knows what in phonics! With 33 children in my class this year I have to be on top of my game ;). I created a Sound Identification Sheet that I find great. I use it at the beginning of the year and at the start of each term to see who knows what. You would have to check more often if children are struggling or if you teach Infants etc. I also have these rather nifty sheets to help me check sounds. 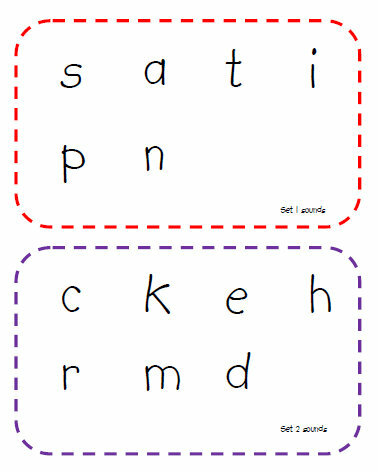 They are based on the Jolly Phonics teaching order, as are the Sound Identification Sheets. *Please note that you no longer need Google Docs open. Just click on the image! As a teacher I also need to know what sounds are proving tricky over all for my class. This helps with my planning. I usually use post-its and hastily scribbled notes. They do the job but I figured that I could do better than this! It is soooooo much easier to see where generally difficulties and weaknesses are. I hope that you find it as useful as I have. How do you keep track? Do have any tips that you would like to share?! I was delighted to find this one by “Teacher Created Materials Publishing”. 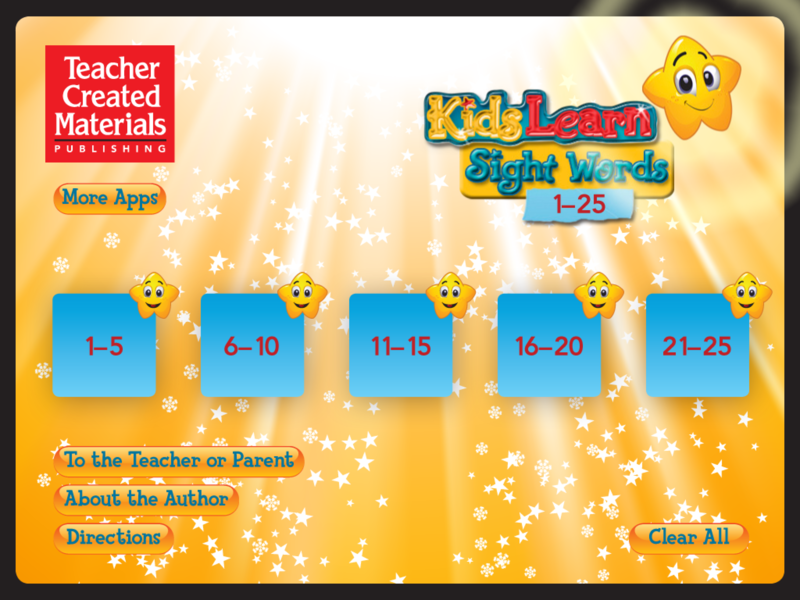 As you can see it covers 25 high frequency words (HFW) that children need to learn to read “by sight”. This means that they are not phonologically regular and cannot be sounded out. I love the fact that the words are broken up into bite sized chunks. Your child can then learn or revise just a small number, experience success and move on to the next level. It can be frustrating to be staring at a very long list of words! The app is very user friendly for children. It is brightly coloured and nice and large for little hands to use and to read. To record yourself saying the word- click the microphone button and keep it depressed while you say the word. At the end of your 5 words you make a jigsaw, play hangman, concentration or Tic Tac Toe. Kids are all about the games…! It’s nice to find an app that you can use as a test. You could use it to test your child’s level of recall by not pressing on the “star”. 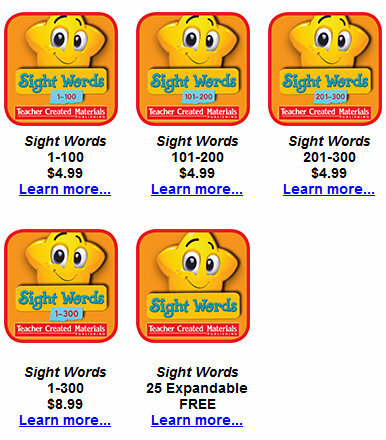 In fact, if you go to their website by following this link you will get a printable checklist for sight words 1-25. 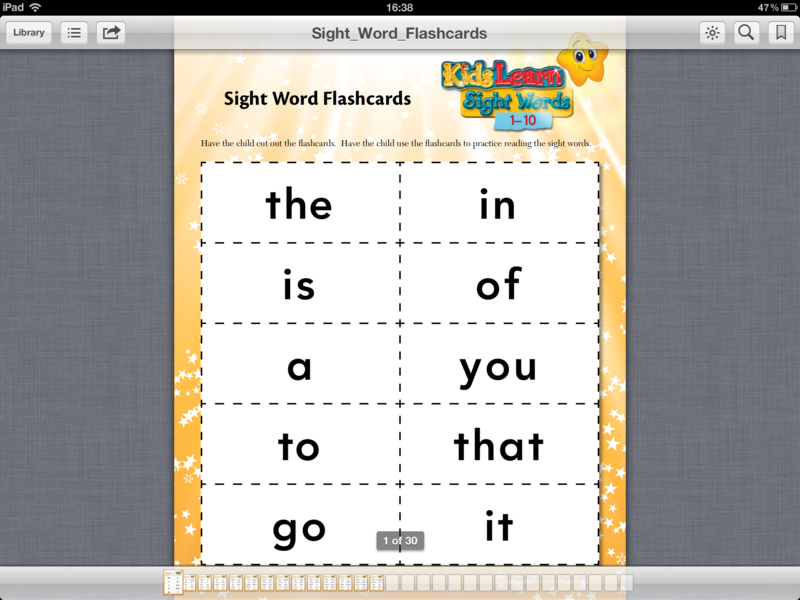 You can also download these free printable flashcards from teachercreatedmaterials.com. You could print a double set and play “snap” or “go fish”. 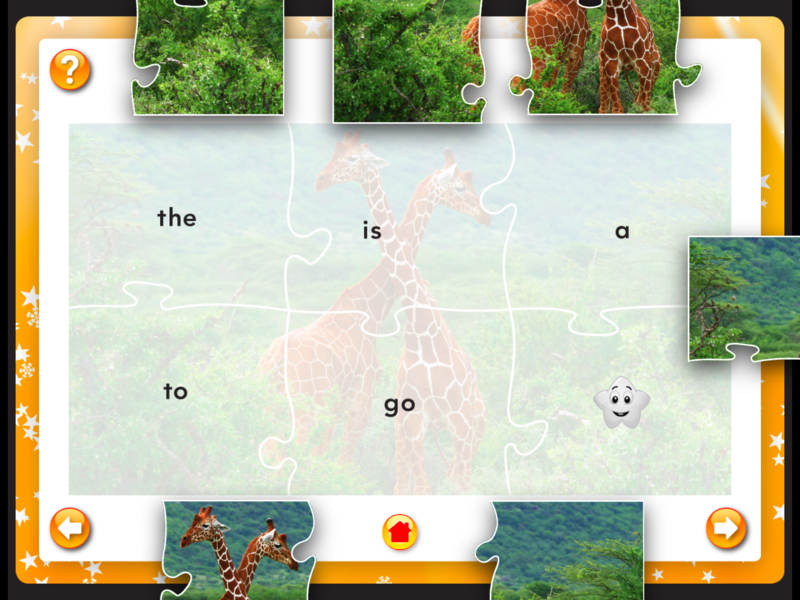 I just love how well thought out these teachercreatedmaterials.com games are. I can hardly believe that this app is free! I was pleasantly surprised to see the cost of purchasing the full app. Please click here to be taken to teachercreatedmaterials.com app store. I hope that you find this post useful. Are any of you already using this app? Have you others that you can recommend? 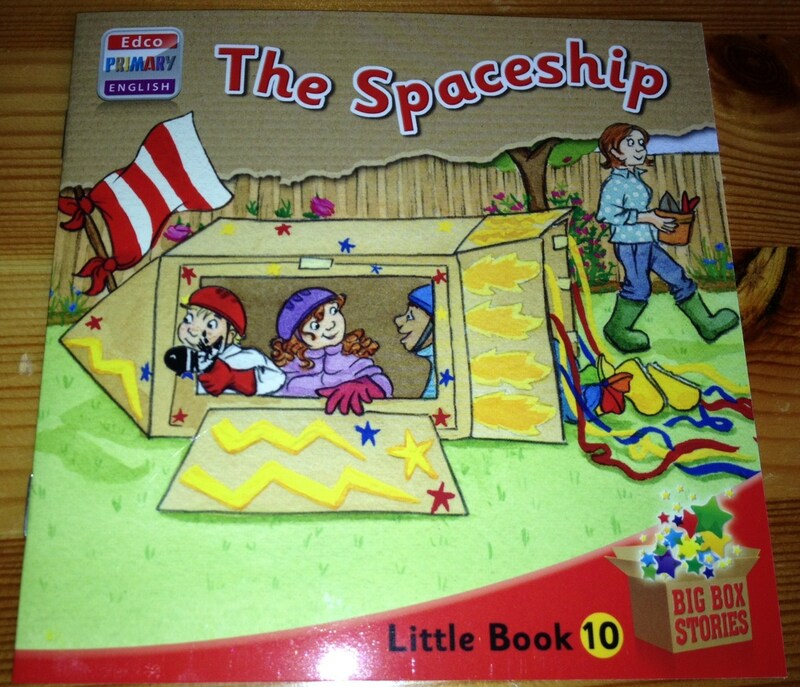 I came across a really lovely new series of books for Junior Infants last week. It is produced by Edco Primary English and it is being launched for the start of the next school year. ” My Little Box” is a lovely concept and very well thought out. 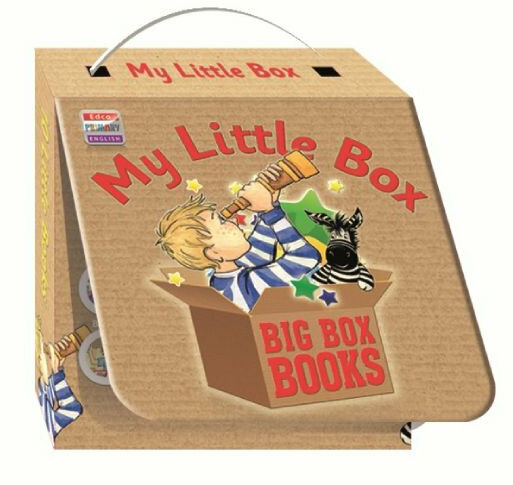 The box contains 10 little stories books for small little hands. The stories are about the adventures of Danny, Zeb ( his stuffed zebra), Emma and Josh. Not a weird alien or odd sounding name in sight for a change! 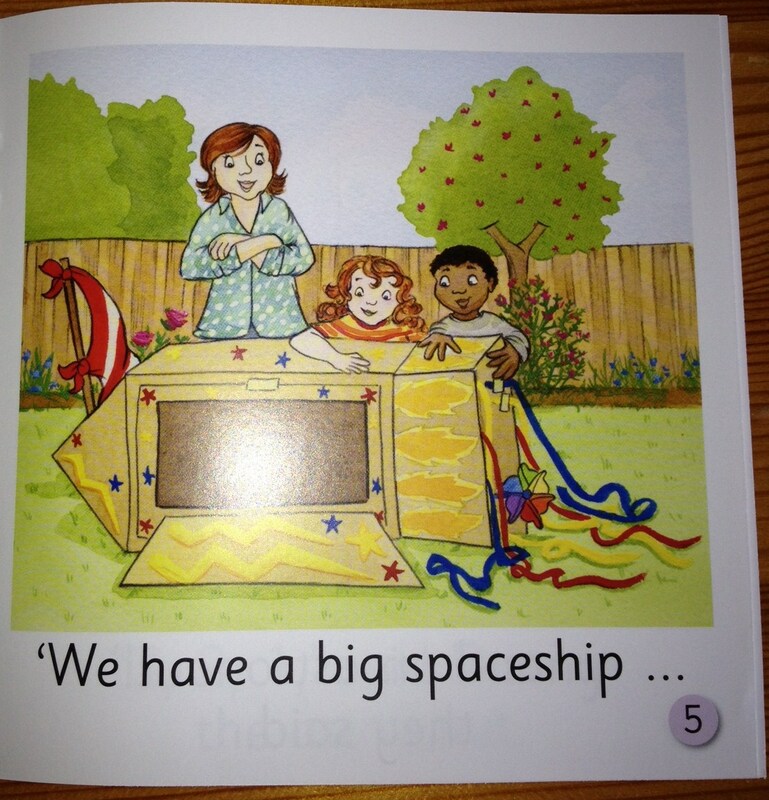 The stories are based on topics that young children can easily relate to: Halloween, the market, saying hello and goodbye, the playground, “I can”, the telescope, tree houses, the swimming pool, Danny and his Mum and making a spaceship from an old box. I love that they books contain lots of high frequency words and that each book only covers 6 new ones at most. They are also repeated over and over in the book. The controlled introduction and frequent use means that children will find them easier to learn to read. The HFW are based on the Dolch list. Inside the text is lovely and clear and well spaced. It also has a font similar to that used in Jolly Phonics. I love joined up thinking! I am delighted to see that Irish textbook manufacturers are finally waking up to the importance of these for beginner readers. I have spent far too many years teaching children words that are not “valuable”. By this I mean words that are not likely to pop up in the next book they read. I think that Infant books should be based on Dolch words and the others should be decodable. There is no point in teaching phonics if the first book you hand out contains precious few words that can be sounded out! I love the idea of beginner readers getting to take home 10 stories rather than 4 big books. It can be demotivating for struggling readers to be faced with a large book and lots of words to learn in one go. This format means that children only need to learn a few words before they can take a book home and read it for Mom. How motivating! “My Little Box” costs 9.95 Euro. Follow this link for further details. Edco have even thought of Reader Rental schemes and will allow you to purchase books individually to replace books that are sodden with orange juice ;). Unfortunately, my school is not searching for a new scheme at present. I really wish that we were! It is one to keep in mind for supplementing your classroom library even if you, like me, are stuck with older schemes. If you are a parent of a Junior Infant next year it is worth buying and reading with your child to supplement other schemes used in your child’s school.